Chattanooga State Community College in southeast Tennessee is known as the “Home of the Tigers.” Geese in Tennessee probably don’t spend much time worrying about tigers, but maybe they should after approximately 100 resident Canada geese were removed from Chattanooga State’s campus and exterminated by federal wildlife authorities. Well-kept lawns and ponds — both of which are present on Chattanooga State’s Amnicola Highway campus — are very attractive to Canada geese, providing excellent forage in the spring, summer and fall. The birds are often considered pests in urban areas, though, because of their sometimes confrontational behavior toward humans and the fact their droppings contain a litany of bacteria that can cause people to get sick if the feces are inhaled or ingested. Cryptosporidiosis is one of the risks. Research also suggests Canada geese can transmit salmonella to cattle herds and a flock of migratory Canada geese caused US Airways Flight 1549 to crash land in the Hudson River off midtown Manhattan on Jan. 15, 2009 — the famed “Miracle on the Hudson” incident. People were turned off by the piles of Canada Goose poop stacking up around Chattanooga State’s campus — 50 to 100 pounds per day, according to a college spokesman — and large flocks of the ubiquitous waterfowl can actually defecate enough to reduce water quality in ponds and wetlands. However, the handling of Chattanooga State’s Canada goose problem was clearly mismanaged, leaving both the school and U.S. Department of Agriculture now pointing fingers at each other. Canada geese are basically the cockroaches of waterfowl. Breeding populations are found in every state and province of North America — from high tundra to desert outskirts, from remote prairies to New York City’s Central Park. If NASA ever succeeds in returning to the moon, it would not surprise me if molting Canada geese taking up residence alongside the Sea of Tranquility chase the astronauts back into their lunar lander. 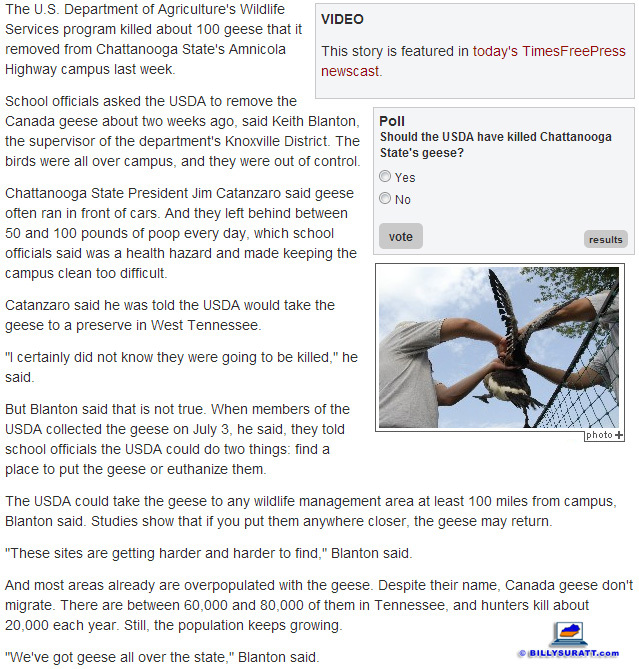 But questions have arisen over whether Chattanooga State’s Canada geese actually needed to be euthanized — most probably using poisonous gas — or simply fell victim to miscommunication between school administrators and government wildlife officials tasked with mitigating the problem. “I certainly did not know they were going to be killed,” Chattanooga State President Jim Catanzaro told the Chattanooga Times Free Press. However, the newspaper says U.S. Department of Agriculture Knoxville district supervisor Keith Blanton told them that’s not true: Blanton told the school the USDA could either relocate the geese or exterminate them. The Times Free Press story doesn’t come right out and say Chattanooga State — ostensibly through its president — made the final decision to euthanize the geese, but that’s the conclusion a reasonable person would draw from their coverage. WRCB Channel 3 Eyewitness News doesn’t come right out and say the USDA made the final decision to euthanize Chattanooga State’s geese, but that’s the conclusion a reasonable person would draw from their coverage. “It’s still unclear where these geese will be moved and we are told that this was all done in a humane fashion,” Chattanooga ABC affiliate WTVC-TV Channel 9 reported on July 3. On July 9, News Channel 9 reported online that “At the time, a spokesperson said the birds would not be harmed, but it turns out, they were destroyed.” However, WTVC’s Web story also quotes the school’s president as saying he knew “euthanization was a possibility.” This also conflicts with the July 11 Times Free Press narrative. “I was, you know, truly saddened by it because we, we didn’t intend, we never intended, or I certainly didn’t, to have an outcome like this,” college president Catanzaro told News Channel 9 on camera. Catanzaro also said the fact the geese had to be killed will change the school’s removal procedure in the future, Sneed reported. “And I think in the future if we’re gonna do any relocation, we’re gonna do it ourselves,” Catanzaro said. “I think for the whole society we need to probably think more like you’re causing us to do here by putting this on television, we need to think more deliberately about how do we coexist,” Catanzaro told Fox 61. Last and — at least in this case — least, Chattanooga CBS affiliate WDEF-TV Channel 12 reported July 11 that Catanzaro said he didn’t know the USDA would kill the geese removed from Chattanooga State’s campus, but that “A spokesman for the program said the school was told the geese would either be placed elsewhere or euthanized.” Based on the scant five sentences News 12 devoted to the story online (bylined to weekday anchor Amy Katcher), WDEF’s coverage appears largely derivative in nature. News 12 does get points for trying, though — The Chattanoogan online newspaper doesn’t appear to have covered the Canada goose euthanasia story at all. In rural areas, Canada goose populations are kept in check by myriad natural predators. Raccoons, skunks, foxes, crows, and snakes all prey on Canada goose eggs, while snapping turtles, foxes, bobcats, hawks, coyotes and raccoons prey on young geese (called goslings). Coyotes, bobcats and humans are the primary predators of adult Canada geese. By 1992, an estimated 300,000 resident Canada geese were living year-round in U.S. cities, according to a 1997 study published by the Jack H. Berryman Institute for Wildlife Damage Management in conjunction with the Association of Fish and Wildlife Agencies and Utah State University. In the state of Maryland alone, more than 100,000 resident Canada geese were estimated to be nesting within the state’s boundaries by 2003, a number which fell to less than 90,000 in 2011 because of increased awareness of the problem and stepped-up eradication efforts — including euthanasia. Virginia officials estimated their state’s resident Canada goose population numbered in excess of 200,000 birds by 1996 and was growing 10 to 15 percent each year. In 1996, Virginia wildlife managers developed the nation’s first damage management program employing mass euthanasia as a means to help mitigate the resident Canada goose problem their state was facing. Virginia’s previous program relied primarily on tactics such as harassment and relocation, methods which become increasingly harder to implement as non-migratory Canada goose populations increase. The Virginia approach was an “integrated” plan comprised of a combination of biological controls, habitat alteration, harassment, exclusion, husbandry, chemical repellants and population management strategies (including capture and euthanasia). Euthanasia was added to the mix because the most popular Canada goose population management method — hunting — couldn’t be employed in many urban and suburban areas. More than 1,500 Canada geese were captured alive in Virginia in 1997, then brought to meat processors for slaughter, packaging and distribution to local food banks. The plan was implemented by the U.S. Department of Agriculture’s Animal and Plant Health Inspection Service, commonly known as APHIS, in conjunction with the Virginia Department of Agriculture and Consumer Services. A statewide charity, Hunters For the Hungry, assisted with distributing the processed geese to food banks. Since then, APHIS has expanded the program nationwide. Federal regulations were also loosened in 2012 to make it easier for landowners to obtain permits for destroying resident Canada goose nests and eggs located on their property. 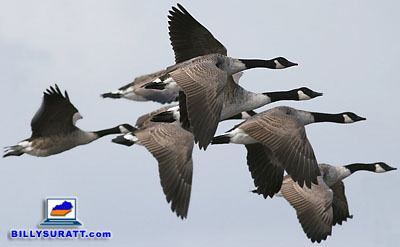 Canada geese, their nests and eggs are protected by the Migratory Bird Treaty Act of 1918. The geese can be legally hunted in the fall and early winter, but a permit must be obtained from the U.S. Fish and Wildlife Service in order to kill geese or destroy their nests outside the legal hunting season. Additional state laws may also apply, but Kentucky and Tennessee both recognize federally-issued resident Canada goose nest and egg depredation permits with no additional state permits required. 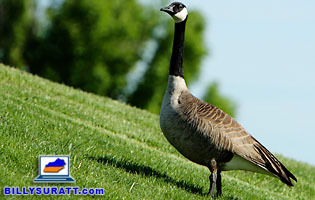 The “giant” Canada goose (Branta canadensis maxima) was once prevalent from Canada’s Manitoba province — located in the country’s central prairie region — south to Kentucky, but was believed to be extinct by the 1950s. In the 1960s, however, isolated populations of giant Canada geese surfaced in Minnesota and an intensive repopulation effort was begun along the Mississippi Flyway. Ironically, conservation efforts to reestablish giant Canada geese populations proved so successful that it’s those very same geese which are now causing problems. However, giant Canada geese aren’t “wild geese gone lazy,” as the Smithsonian puts it, they’re just descended from a non-migratory subspecies of Canada goose native to North American prairies — prairies which happen to be quite similar in makeup to modern golf courses and college campuses. The National Audubon Society says “The current status of the Canada goose is one of the great success stories in the history of North American wildlife management.” The current status of the Canada goose on Chattanooga State’s campus, however, is clearly not. In fairness, though, it’s quite possible 100 more giant Canada geese will show up at Chattanooga State any minute now. Maybe 200.